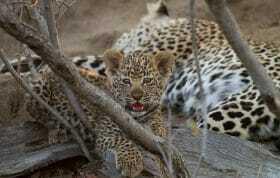 The mystery leopard from the post earlier in the week is indeed the Mashaba female. Well done to those who put either her or the Tamboti female as their guesses, they are from the same lineage and share the rich golden coat that the Sunset Bend female possessed. With no facial pictures to base a decision on, confusion between the two would be easy. 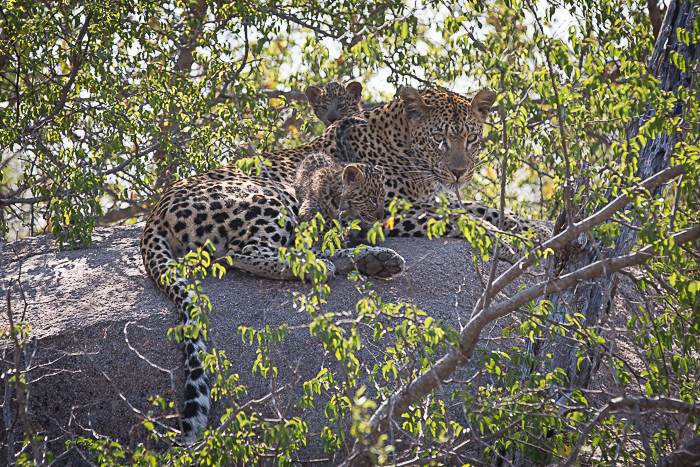 The Mashaba female and her two cubs have been moving around the deep drainage lines to the south and west of the Londolozi camps – a difficult area to track leopards in, let alone a mother attempting to hide away young cubs. Boulder clusters and a hollow leadwood log have been her preferred choices of dens so far, but as the cubs are now at an age that they can begin eating meat, her choice of hiding places is going to have to widen as she moves them more and more. They are entering a dangerous time in their lives as they accompany their mother to kills, and will be forced to escape danger on a more regular basis as hyenas and potentially lions attempt to rob them. A hasty retreat into the trees is the best tactic, but for little cubs who are only just learning to climb properly, ‘haste’ and ‘climb’ won’t be going hand-in-hand for awhile yet. Fortunately their mother controls a relatively small territory, so she will never be too far away from them or have to lead them to too-distant hiding places. One of the cubs lets out a yawn while its sibling – whose head is just visible next to its mother’s tail – remains a little more shy. 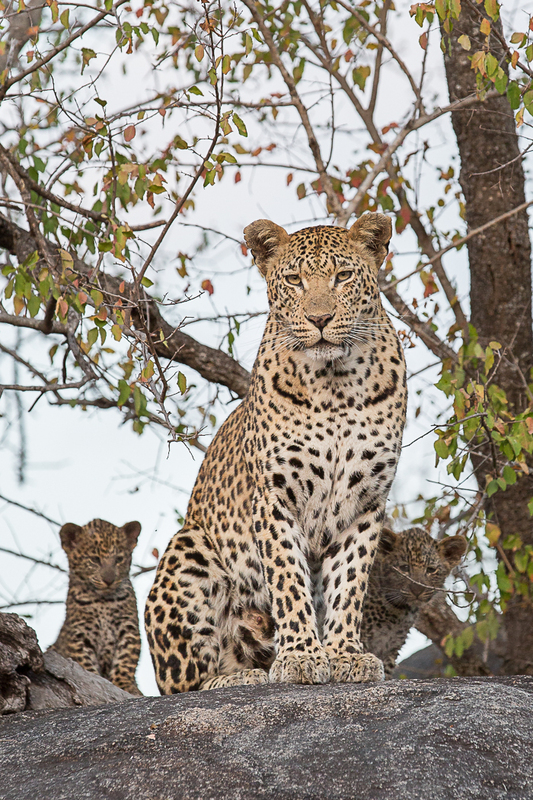 Still relatively shy around vehicles, the cubs are only viewed when the mother is with them. Bright sunshine in the late morning allied with a scraggly Buffalo thorn tree made for tricky conditions, but we managed to capture a few shots of the family on this, their first time seeing a Land Rover. 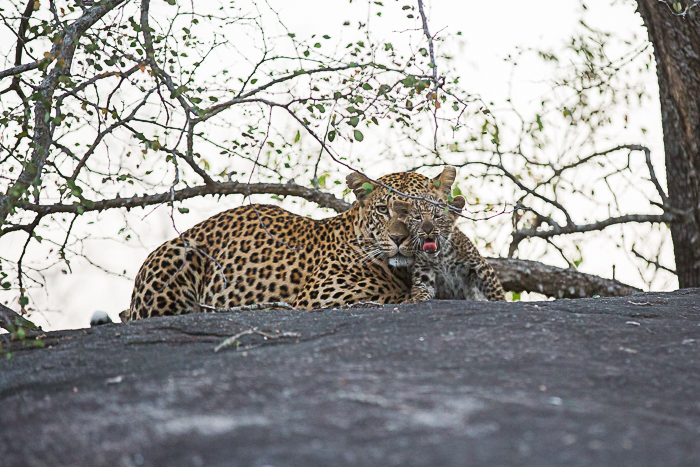 By far the biggest danger for young cubs is male leopards that have not fathered them; these are either nomadic or neighbouring territorial males that will kill the cubs should they encounter them. 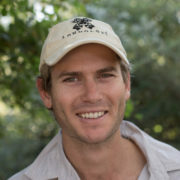 Fortunately in this case, the father of the cubs (who we believe to be the newly territorial Robson’s 4:4 male) controls a section of the river that completely encompasses the territory of the Mashaba female. From the Sand River southwards to the Maxabene, this male’s range and control thereof should go a long way to ensuring the cub’s safety from other male leopards. Vagrants are always a threat (the Quarantine male featured in The Week in Pictures #189 walked little more than 100m from where the cubs were being denned) but generally do not stay in the area long. 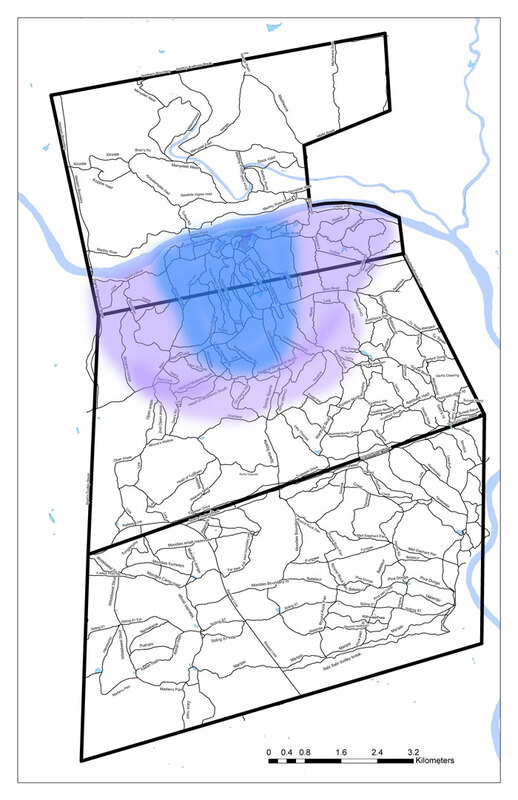 The Robson’s 4:4 male’s territory is represented in purple while the Mashaba female’s territory is represented in blue. The fact that Kevin was able to film this taking place, particularly the mother carrying the cub up into the tree, is phenomenal in itself. I know my hands would have been shaking far too much, knowing how unbelievably special it is to witness something like that. Well done to him for keeping steady. With the increased hyena activity around the river and central Londolozi, primarily, we believe, due to the westward movement of the Majingilane coalition, the cubs are in for a tricky few months until their climbing skills improve. The Mashaba female, like her mother the Vomba female, is actually not renowned for hoisting kills, having preferred in the past to hide them in deep drainages or dense thickets. These days it seems she has no other option but to keep them in the trees though. With seven cubs already having been lost on Londolozi this year (the Tutlwa female lost three while the Nanga and Tamboti females have lost two each), Mashaba’s litter are the only two that remain. Let us hope they remain as safe as possible in a dangerous world. A BIG thank you to James and Kevin for sharing such great photos and video of the cubs! With my Sunday cup of coffee in hand, I couldn’t wait to see what the post would be today! Made my day!! Congrats to the new mom! Mashaba looks very regal and proud in the middle photo. Some lucky guests at Londo are bound to have some great sightings! I do hope these beautiful cubs survive, will be waiting for updates on their progress. Amazing video footage. Awesome blog. The pictures and video are fantastic James and Kevin and amazing to see her carrying the cub up into the tree!! It’s so great to see cubs again. I really hope and pray that Mashaba will be able to keep them safe. Thank you so much for sharing this — you really made my day! Adorable! They had just been born when I visited a few weeks ago, so was anxious to get a look at these two little ones. 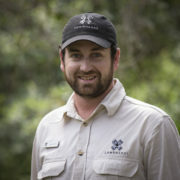 He is a male that is new to the area who we believe originated in the Kruger Park. He was first seen as a sun-adult male in the Manyelethi Reserve to our north a few years ago and he seems now to have established himself along the Sand River. 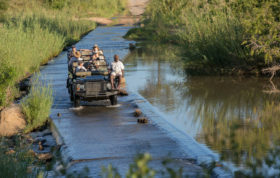 He is still not 100% relaxed around vehicles, hence our belief that he came from the Kruger. As sightings of him become more frequent I’m sure he will become more and more habituated. I will be praying and hoping that these little cubs make it. What a fantastic video. I never knew leopards carried their young into trees like that. Great pictures as well. Nice reveal. It was a first for us too! Kev says he had tears in his eyes when he was filming it! A truly once-in-a-lifetime thing to see! It was such a privilege James … such a special experience to spend time with Mashaba and cubs! We wish mum and babies all the luck in the world. Keep them safe until we return again.